Where is this “credibility” derived from? Jesus Christ may have provided the groundbreaking conceptual foundations for the unprecedented ethical soundness of Western civilisation today (relatively, that is). And even to be fair to those who attribute the dubious property of “divinity” to this great man the advent of Christianity heralded in a replacement of the schizophrenic God described in the Old Testament with the concept of a “loving” and “fatherly” God to worship in our time. As to Christ’s claim of being the Son of God, well, we have to rely on Scripture, that true-by-edict body of “knowledge” which survived centuries of “moral ascendancy” and unquestioned beholdnness from its own scholars and believers with hardly a whimper of scrutiny from any objective third party (under fear of genocidal attacks from the Church’s Forces of Righteousness). For all we know, the last 2000-odd years of the dominance of Scripture may have been nothing more than an exercise of systematically putting words in a great man’s mouth on a massive scale. I therefore do agree that even removing the glue of “divinity” that for centuries has commanded fearful and in many cases insane obedience from most Christians; specifically the fear of the “fires of hell”, which in essence are rather dubious threats against what you shall experience after death (remember: nothing in life everything in death…); Christianity remains as Jurgen Habermas asserted, the foundation of the major civilising force of our time — European culture (let’s not forget who‘s invention “democracy” really is, folks). The Man JC’s key contribution to our lot are his ideas and his example. The Church as an “institution” in all ironies has actually devalued him as a man (as one of us) by attributing to him a “divinity” that remains debatable to this day. The value of Jesus Christ’s objective and tangible contribution to humanity was severely diluted by a humungous layer of convoluted dogma and mystic jibberish that is administered by that embodiment of conflicts-of-interest that is the Catholic Church. Whereas men such as Albert Einstein and Plato stand timelessly on the robustness of their own personal achievement, Jesus Christ was deprived of his chance to stand among them upon the same sort of footing by a Church that presumed to enforce reverence for him through the sword and through the use of principles of clever marketing. 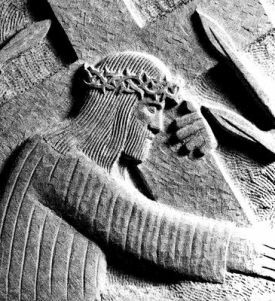 Thus Christ will be known not as the man and not for his mind but as a mere iconic centre of an “institution” that today is rapidly making itself irrelevant and pulling down the great man with it. Happy Easter Holidays and remember to use more brain and less of the shrinkwrapped recycled thinking that dominates our sad society. I’ve never understand how an institution can lay claim to “moral leadership” but never accept responsibility for anything that goes bad. Christ didn’t run around saying “the Devil made me do it!” Or, take the case of poverty aggravated by unrestrained birthing, what kind of leader exclaims “the government is underperforming economically”. Then inserts itself into government affairs to block birth control education. I guess we can attribute it to them not practicing what they preach. Especially in the Philippines where respected authorities (like the Catholic Church) keep on telling their followers to, “Do as I say , not as I do”. Of course the followers will trip over themselves in order to obey because most Filipinos are brought up being taught that respect is given, not earned. We need to see Christ’s example as a man…as he walked the talk and lived what he preached…and then ask ourselves…was He truly the son of God or an insane and delusional sado-masochistic man? When I see Christ’s teaching…and then his sacrifice and passion…then pause and think…truly think about it…I cannot help but think that HE is made of stronger stuff than any man could be. To suffer such humiliation and punishment in obedience to HIS FATHER…now what man can claim the same kind of obedience…LOVE, HUMILITY AND OBEDIENCE. This is what Christ taught us…this is the walk HE talked…the life HE lived and preached. Was He the son of God or was He simply insane? I choose to believe the former. Thank Benigs for being our voice and giving us the courage to find ours. Thatâ€™s a nice challenge to all Christian believers, but this space is much too small and even with a book one canâ€™t fully rebut your legitimate claims. It takes a whole lot of history, secular and Christian, of cultural and literary studies, and the entire gamut of the human sciences to engage in a wholesome discussion about faith in general, and faith in Christ as God in particular. But a host of scholars, Christian and otherwise, have already tackled those issues since the birth of Christianity. On the other hand, in the inner sanctum of an existential human being who arrived at faith in Christâ€™s divinity through a sincere painstaking personal quest for truth, his/her faith is non-debatable. Many indeed have tried to question their own faith–take Augustine of Hippo, Blaise Pascal, Teresa of Avila, John Henry Newman, just to name a few– only to end up strengthening it. If the epistemological claims of science itself have been questioned and have been simply taken in â€œfaithâ€ by most of us, scientists and laypeople alike, itâ€™s not unsurprising that in every generation the truth of the divinity of Christ continues to be contested. “The proof is in the puddingâ€ would be the most eloquent rebuttal of a true Christian. It is “eloquent” because said “pudding” is beyond the reach of human inquiry — which is quite convenient for those who seek to propagate religious dogma, a fact from which the power of organised religion is derived. Isn’t all human inquiry solipsistic…and at the same time doesn’t it try to proselytize? There won’t be any social organization if there were no attempts at self-propagation. How else would theories, sciences, practices have followers if they don’t spread their own “dogmas”? You are right to put dogmas in quotes when you used it in the context of what binds “followers” of science. Science may be just as dogmatic in practice (every field has its politics). But at its most fundamental, every theory and framework in science is open to inquiry, scrutiny, challenge, and modification. You can’t really say the same as far as religious dogma goes. As far as the Church as a human institution is concerned, its teachings are not closed to “inquiry, scrutiny, challenge, and modification.” The process may take decades, even centuries, but it has happened. Look at all the scholarships–secular and not– that resulted from that to see that the Catholic faith has been a fertile ground for inquiring minds. Look at what the Vatican Council II has brought. Look at all the current upheavals in Catholic thinking that spring from the laity’s participation in their faith development–ethical, philosophical, political, economic concepts and practices. The RCC is not all the hierarchy alone. The Vatican Council II has recognized (albeit belatedly) the central role of laypersons in the life of the Church. Right, every theory and framework in science “is open” but every one of them may simply opt to die if not successful in persuading or threaten dissidents with “excommunication” – much like the RCC does (and any religion for that matter, e.g. Islam, all forms of Protestantism, etc.). See Thomas Kuhn. Yes, apples to oranges–comparisons applicable even to contending theories within the domain of science or any other field of inquiry. “Decades or centuries” is an eternity compared to the almost daily pace at which scientific knowledge corrects itself and adds to its scope. You are right when you say “it has happened” similarly to religious dogma — it has under exceptional circumstances. Religious dogmas evolve very slowly because they are end-products of theological thinking that are more fast-paced akin to what you call the daily self-correction of scientific theories. But we may have to be more attentive to what is actually going on in the theological scholarship. In any case, I admire your critical stance in everything and that can only be positive for all your readers. Hopefully, your critical observations will help Christians purify their faith. Theology cannot be compared to science because it attempts to backward-engineer logic and coherence using established dogma as its starting point. It is the antithesis of true free-inquiry where the outcome or path taken by said inquiry is not pre-conceived or pre-determined. I concur with aurora borealis’ post. Indeed, if devaluation of Christ meant centuries of keeping, safeguarding and gathering of scriptures and teachings which came from Him and His disciples so that they can be read and learned from generations to generations, formulating a book that tackles all aspects of life according to His teachings (Cathecism of the Catholic Church), producing great thinkers and philosophers from within the Church whom themselves challenged their own faith and ended up strengthening it further (even nowadays, I know a lot who were staunched persecutor and attacker of the catholic faith but ended up its defenders, I myself included), daily masses that focuses and Christ’s words and actions, and all other things that we can attribute to Christ’s teachings and examples, I’m not sure how much more we can show valuing Him as a great person. Indeed he’s a great person, and a great God as well. Even Einstein, the author’s example, never took claim of his personal greatness with what he said that before God, we are all equally intelligent and foolish. The printed Bible today of the RCC is one whole marketing attempt to make their religion the uncontested dominant force for all Christianity. Starting with the Council of Nicaea and through all the redactions they made into what should go into the Bible and lessen the contradictions (and henceforth, arguments) that may arise from the inclusion of Apocryphal books into the canonical Bible itself. But then, they themselves have being screwing their own dogma by committing stark errors (some may probably be even considered heinous crimes in itself) to the supposed central philosophy espoused by Jesus Christ (the man, divinity, figure, whatever)… Thus, a dichotomy of epic proportions! Let’s put things into perspective. Before, the Church was underground, persecuted, hunted. With that, these people were divided, confused but are all fighting for one thing, freedom to practice their faith. With that, they continuously met secretly discussing matters of faith. Until the time they won their freedom and were able to practice the faith, they held councils and for years, were able to formulate a ‘constitution’ that unites the faith and define which is true according to the apostles’ teachings. With them, everything was fresh as some were still able to get the oral and written traditions first or second hand from the apostles. Therefore, the margin of error is ‘lesser’ compared to those who are living centuries and milleniums later including is who can only get that much ‘unadulterated’ information from books, websites etc which were written and researched by people living in the same timelines as ours. Credit Protestantism with marketing the Bible. Sadly, RCC is a latecomer, fully opening the Book to its faithful beginning only with the Vatican Council II. As mentioned above, RCC is not only the Pope, the Bishops, and the rest of the clergy. Much of the progress of the Church in history has come from the faithful. There may be rotten apples in the basket, but there may be many more good ones that don’t catch attention. As in all social institutions, kings, leaders, officials may steal the show and more so when we are dying to pounce on them. The validity, legitimacy, desirability of the institution they represent may still remain intact as long as there are members to keep the body alive. But we should be reminded that no one is compelled or coerced to be a Roman Catholic (well, not anymore that is). 06. It follows that a wrong is done when government imposes upon its people, by force or fear or other means, the profession or repudiation of any religion, or when it hinders men from joining or leaving a religious community. 10. It is one of the major tenets of Catholic doctrine that man’s response to God in faith must be free: no one therefore is to be forced to embrace the Christian faith against his own will. 11. God calls men to serve Him in spirit and in truth, hence they are bound in conscience but they stand under no compulsion. 12… the person in society is to be kept free from all manner of coercion in matters religious. As you yourself implied on your first paragraph though, the church did expand to its current size through forced evangelisation. If it is growing organically today, it is because it is baptising into its ranks people – infants – who lack the ability to decide things on their own. Those who have mature enough minds tend to opt to leave or remain as non-practicing or lukewarm members. This is precisely the reason why there is this rite Roman Catholics call â€œRenewal of Baptismal Vowsâ€ which is celebrated or performed by Roman Catholics (well, those who still claim to be), annually, during the rites held on Holy Saturday, before Easter Sunday. A Roman Catholic is free to renew or not to renew those vows or, perhaps, decide to become a Catholic-by-name-only, or even leave the Church. As regards Infant baptism, Catholics obviously apply the policy that the religion of the child follows that of the parent; and so, the child of a Catholic should be baptized and officially become a member of the Church as well. Perhapa, the jus sanguinis rule on nationality may have been patterned after this Church teaching. Actually, it’s the sacrament of Confirmation where a young Catholic reaffirms his being a member of the Church. Thing is, either way, it is not as if one’s choice of religion — whether it is made as an adult or foisted upon one as an infant — is a deliberate or thought-out choice for most people. It’s a default option prescribed by the greater society within which very few (if any) options are offered. And you are right of course — nationality is similarly a notion one is born into and comes to be an integral part of one’s identity. It takes a special sort of thinking to be able to step back and regard all that with an objective and critical mind — the sort that is in woefully short supply in the Philippines. Well, it seems that the RCC are the biggest hypocrites since a person cannot be unbaptized, even if he/she wants out – quite similar to religious coercion since babies cannot decide for themselves. You are forever marked as a member of the RCC. First of all, it is on the assumption that you completely know what you’ve commented. One can’t be a Catholic if he/she is not baptized even though the Church recognizes also the other two forms of baptism. If one wants out of Catholicism, he could just left the religion and pursue whatever he/she wants. How about discussing abortions? The unborn child, the pro-choice or pro-abortion always refer to as fetus, can’t also decide for themselves and abortion is irreversible. We, as adults, as parents, decide for our children’s clothes, education, etc. until he/she is of legal age. So where is the hypocrisy of the Catholic religion? As for the link you’ve provided, read it again, and this time, SLOWER. And to the author, though I disagree that it’s the Church’s fault, I am thanking you for reminding us catholics of what the lent truly means. And that is to take a second look at Christ, His words and His works. It indeed saddens me seeing catholics forgetting what Christ did for us and only remembers Him during this season. It is not the Church’s fault but truly, most catholics are guilty of devaluing Him. After all, the Catholic Church is not just the ecclesiastical hierarchy. Ultimately, she is the laity. Ahhh, Christ, I think he’s smart for his age I think it’s also possible that he may be from a future/dimension where they can create dimensional holes where bread and fish and wine can go through. And where clones of dead people can be made with their memories intact. Also, he might be a robot powered by water with regenerative capabilities. Indeed you are correct in saying God transcends time and space for indeed He does but maybe not the way as Erich Von Daniken or Zecharia Sitchin theorize. Great article. I have always viewed Christ as one similar to Prince SiddhÄrtha or better known as Buddha. Someone who possessed great wisdom and shared the knowledge to many. Perhaps he is really the son of God but it is more likely he is a wise man who was turned into a god for political gain and control. Just study the history of the Bible and you will see it was changed and revised so many times sometimes to fit the political agenda of that time. It was not the Catholic Church who declared Jesus as divine or God but Jesus declared Himself as God and divine as written in the Gospels. Obviously the writer did not read the bible or if he did did not understand it. As a matter of fact, the Catholic church study, interpret and explain the bible in a critical manner, the term is exegesis. The bible is the only religious document ever to be studied that way. Now, Jesus Christ leaves it to each of us to believe or not in Him as God and a man at the same time, not half man or God, or a centaur like creature, he is not like Buddha or Mohammad or any human founder of religions who remains dead to this day. For Jesus was tortured in an extreme way, died but resurrected and lives today. All Catholic rituals are acts to worship and honor Him, like a soldier salutes a general as respect and acknowledgment or a man offers a toast to the president as a symbol of honor. If a man is worthy of such rituals is not Jesus, our Lord, more worthy as such of rituals? It is said that many hate the Catholic church because of what they “think” it is but many more love it because of what it “really” is. God bless you Benign0, and I enjoin you to know the real catholic church. Nah. The Catholic Church here in the Philippines is more like a distorted one. Then how can you explain folk Catholicism BTW? I know more since I have knowledge on theology. Protestantism exists in order to reform the Catholic Church, especially its blunders in the past, as it was existent today. We have different views. For most Catholics, they treat Christianity as a religion. But to true servants of Christ, Christianity is a RELATIONSHIP. Protestantism trying to reform the Catholic Church? With 38,000 denominations of protestant churches all over the world and only one Catholic Church I think protestants are reforming each other. Martin Luther have started it. BTW, with 38,000 denominations, there is one thing: they are serving the same God. But the Catholic Church is not safe from its controversies and blunders throughout history, you know that. You said “was written in the Gospels”. The assumption there is that said gospels (those ones held by the Catholic Church to be the de facto “holy” scripture upon which practice of the faith is based) are accurate transcripts of what actually transpired in the life of Jesus Christ. The Roman Catholic Church is no longer a Christ-centered, Bible-based Christianity since the Great Schism in 1054. Since then, Catholics worship Mary and saints more than Our Lord Jesus Christ.